I was down in Southern Cal last week on a detail and I was finished working early Friday. As luck would have it ComicCon was going on and I had a buddy down there who had been there for two days already. Well it was amazing, as my friend Jordan put it it is "Burning Man" for the nerd crew. It start off with I only had one afternoon there so I did not get a chance to see any panels, advance screenings, or actually look at the comic tables. 1 Made a run through artists alley and spoke to many artists that were cool as hell. 2 Got a chance to talk guns with Lou Ferrigno. He was so proud of his new Barret 416 cheyanne. I think I got him a bit miffed when I told him that well at least it is close to a fifty. 3 watched many fans get dressed up as their favorite characters. I guess I must have missed all of the really trick costumes, granted it was late in the day and I guess the rubber and latex gets hot and sticky. One small aside while I am very eager to see the results of your heavy cosplay work, make sure that you remotely fit into your costume. Not just borrow one from your very thin friend. All together it was a great afternoon. I really want to make it there next year for the whole thing. My wife is course registering her complete objection. She states that our child will be around then and she doesn't want the kid to be exposed to the nerd virus! I guess she has a point the young child's immune system will be weak but I guess exposure will have it's benefits. 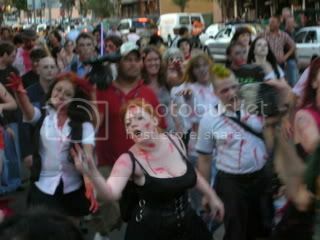 I did not get many pics (due to having only a crappy phone on me) but the two I have are of a Zombie mob outside of the CC. One illustrates that Zombies do obey traffic laws and always wait for the walk icon to be lit. I will have to lift some of my buddies pics and post them here. After the Con the downtown San Diego nightlife was in full swing. There was even a sign on one nightclub that read "Geeks welcome". Pretty girls were in abundance and so were the masses of the socially inept males. If you have even a hint of geek in you, ComicCon would be a great place to spend a day.